It defined a special relationship between the State of Maine and the Passamaquoddy Tribe and Penobscot Indian Nation. It was agreed that these tribes would have authority over their own internal matters on the reservations. At the same time, it was agreed that they would continue the trust relationship with the federal government that had been recognized during the 1970s. It provided federal recognition for the Houlton Band of Maliseets, but did not define a special relationship with the State of Maine. It did not include Maliseet People who were not members of the Houlton Band and the Aroostook Band of Micmacs. It was not until late 1991 that the Aroostook Band of Micmacs won federal recognition. During the fourteen years since the settlement, there have been spirited debates about state versus tribal jurisdiction in many areas, including land use regulation, tribal courts, fish and wildlife enforcement, and educational funding, to mention a few. Many people involved in these discussions have been well versed in settlement issues and terms. Some have not been so well informed. In addition, the general public has only a limited understanding of the land claims and settlement. The purpose of this report to provide information about the key concepts underlying the land claims and settlement (Section 2); the historical context of the land claims and settlement (Section 3); events leading to, views about, and terms of the settlement (Sections 4, 5, and 6); and actions and debates since the settlement (Section 7). This paper is not a legal interpretation of the settlement agreement by the Maine Indian Tribal-State Commission. Nor should it be construed as such. Created as part of the settlement, the Commission is required to review its effectiveness and the relationship between the State and the Passamaquoddy Tribe and Penobscot Indian Nation. The Commission hopes that this report will promote greater understanding of the issues and deeply held beliefs that shape today's debates about tribal-state relations. Sovereignty is the right of people to govern themselves. European settlement raised this issue in an acute form for the Wabanaki People. They sought to retain their sovereignty in the face of European expansion. The claim to be sovereign peoples is still made today by the Wabanaki People. There is a belief that even if the exercise of sovereignty is denied, the right to self-government and self-determination cannot be destroyed. Sovereignty presumes an accepted definition of who "the people" are. Definitions of who does and does not belong can change over time. Forms of government and relations with outsiders also can change. The principle of sovereignty permits cooperation with others, as in trade or war. It also permits dependence on others, provided that this has been freely chosen and can be ended by choice. What cannot be altered is the right of a sovereign people to determine their own fate. He observed that Indians lived in "distinct political communities, having territorial boundaries, within which their authority is exclusive." However, he would not grant that they were sovereign foreign nations. He called them "domestic dependent nations" and declared that "they occupy a territory to which we assert a title independent of their will." He held that Native American tribes retain all of their sovereign powers except those specifically taken from them by Congress. He said that actions taken by Congress to limit tribal rights of self-government must be clearly stated, with any doubts resolved in the Indians' favor. This recognition of the continuation of inherent sovereignty in Indian Tribes is a critical feature of federal Indian law today. Many Native People assert they retain as much right to govern themselves today as they had before the Europeans set foot in the Americas. In his 1831 decision, Chief Justice Marshall also held that the relationship between the federal government and the Indians is that of a "ward to his guardian." Subsequent Supreme Court decisions clarified that the federal government has a duty to act as guardian solely for the benefit of Native Peoples in any matter that affects their interests. Thus was born what has come to be known as the trust relationship, including the Bureau of Indian Affairs to administer programs to assist Native Peoples. Such a relationship or federal recognition by the U.S. implies responsibilities to Native Americans in exchange for their land and ways of life that were given up when treaties were signed. The U.S. also acknowledges certain rights of self-government that were not given up by the Native Americans when a foreign government, the U.S., was established on North American soil. Throughout the 19th Century and much of the 20th Century, the Wabanaki People of Maine were considered "state Indians", because they had never signed any treaties with the federal government. As a result of legal action brought by the Passamaquoddy Tribe, they finally received federal recognition during the late 1970s. This victory of federal recognition would once have been considered a defeat. It was not the aim of Wabanaki diplomacy in the 17th and 18th centuries to become a ward of the United States (a domestic dependent nation), but to continue to exercise complete sovereignty. Federal recognition of the Passamaquoddy Tribe and the Penobscot Indian Nation meant that the reservations fell under federal law and not state law, and that both groups could begin to exercise some of the rights that the State of Maine had never recognized, e.g., the right to have their own court systems. There were other rights, too, such as control and regulation of hunting and fishing on the reservation, jurisdiction over foster care for Passamaquoddy and Penobscot children, and the right to establish air quality standards on the reservations that would be upheld by surrounding towns. It also meant that they were entitled to health services and other federal programs for Native Americans. Aboriginal rights are the basis for the trust relationship between Wabanaki People and the federal government. Wabanaki People inherited these rights because their families were living here before Europeans laid claim to the land. They did not lose their rights to the land or to hunt and fish just because European colonists established governments here. Many of the rights that they did not give up in treaties or agreements still exist and are acknowledged by the United States and Canada. Some treaties upheld by court decisions affirm such rights such as hunting and fishing and crossing the United States-Canadian border freely. The English government and settlers and the Wabanaki People had vastly different concepts of property and land. This led to many misunderstandings, which, in turn, led to broken treaties. The English assumed that when the Wabanaki People gave them rights to land, they had received sole and exclusive possession of it. In this view, the Wabanaki People had renounced claims to occupy or use the land in any way. When the Wabanaki People came back to use the land, the English were outraged. In the Wabanaki view, the English had received a right to share use of the land. The English could hunt and fish and farm, but the Wabanaki People expected to continue to do the same in the same area. The land, in this view, did not have a human master. It was a sacred, social world. It had a life in which one could participate, but one could not transfer exclusive title to it in exchange for English cloth or corn. When the English pushed them off the land and deprived them of the use of it, the Wabanaki People were outraged. Even today Indians and non-Indians view property and land quite differently, and there are many misunderstandings and disagreements about land use. The first explorers from France and England came to the Americas during the 1500s. Their governments assumed that the parts of North America they claimed became their colonies and that they had sovereignty over the land. France and England negotiated and signed treaties in Europe to divide up their claims to North America. The Wabanaki People were never asked to agree to these treaties and their legal concepts and political objectives were ignored. When English and French settlers arrived in North America during the early 1600s, many of them settled land without the permission of the Wabanaki People. This was particularly true of the English. The English colonial government in New England made laws requiring people to acquire land by deed or purchase. Although French law never required deeds or treaties for acquisition of land, French settlers who failed to gain Wabanaki permission violated European principles of international law that acknowledged Native land rights, if not their rights of sovereignty. European settlement raised the issue of sovereignty in an acute form for the Wabanaki People. Their major goals throughout years of conflict with the English were to retain their land and to continue to govern themselves. The Wabanaki People relied a lot on diplomacy to accomplish their goals. They signed numerous treaties with English representatives in an effort to create clear and separate areas of interest as the basis for peace. Treaties often were broken or appeared to be broken. This sometimes resulted in skirmishes or war. One reason treaties failed was because of misunderstandings on both sides based on vastly different concepts of property and land. Another reason treaties failed was insincerity. The British Government and many English settlers did not view treaties as a means to peaceful co-existence. Treaties were honored until it was safe to ignore them. European expansionism required Wabanaki leaders to join together in larger and stronger units. As the years passed, alliances became more widespread and more permanent, as did the perception of common danger. At the same time, Wabanaki leaders wanted to preserve their relationships of equality and freedom. During the early 1700s the Wabanaki People achieved these goals through confederation, the same method later used by the American colonies when they united against the British. Wabanaki elders met at Indian Island and elsewhere as the Wabanaki Confederacy. Abenakis, Penobscots, Passamaquoddies, Maliseets, and Micmacs maintained their separate identities but acted in unison toward common objectives of defense and survival. By the beginning of the nineteenth century the Wabanaki Confederacy was deprived of any diplomatic or military leverage, and seventy years later it came to a quiet end. Because of their own strength and the support implied by their alliance with the French, the Wabanaki People were able to impede the English inclination to intimidate. After the French defeat at the Battle of Quebec in 1759, the Wabanaki People were without their military ally and were in a weakened position. Representatives of the Passamaquoddies, Maliseets, and Richibucto Micmacs went to Halifax to sign treaties with the British that year, and the rest of the Micmacs concluded similar treaties the following year. The British king promised to respect Wabanaki territory in a proclamation issued in 1763, but the governors of Massachusetts, Quebec, and Nova Scotia did not recognize the Proclamation as valid in their territories. When the Revolutionary War broke out General George Washington requested the assistance of the Wabanaki People. In 1775, a British warship destroyed Fort Pownall, which the Penobscots had used for trade. The Penobscots received a letter from the Provincial Congress of Massachusetts urging them to join with the American colonies to defend the liberty of both parties. Joseph Orono urged his fellow Penobscots to side with the Americans. In June 1777, Colonel John Allan of the Massachusetts militia, who was the director of the federal government's Eastern Indian Department, negotiated a treaty with the Wabanaki People. They were to assist in the Revolutionary War in return for protection of their lands by the United States and provision of supplies in times of need. However, this treaty was never ratified by the United States. Also in 1777, the British occupied the St. John Valley and 500 Maliseets went south to Machias. In August of that year the British attacked Machias with four ships and were repulsed by Wabanaki and American volunteers. A number of Penobscot, Passamaquoddy, Maliseet, Micmac, St. Francis Abenaki, and Becancour soldiers remained in the Machias area throughout the war. These actions helped secure that boundary area for the Americans. Despite the help they had given to the Americans during the war, the Wabanaki People were back to their weakened position as soon as the war was over. The encroachment on their land continued without their consent. The United States government did not extend protection to the Wabanaki People following the Revolutionary War. The Nonintercourse Act was first enacted by the newly formed Congress of the United States in 1790 and was subsequently re-enacted five times. It consisted of many provisions regulating activities between American Indians and the non-Indian citizens of the United States. A salient provision prohibited the transfer of any lands from Indians without the approval of the United States. However, the United States government did not apply the Nonintercourse Act apply to the Wabanaki People, because they were under the jurisdiction of the Commonwealth of Massachusetts, which then had jurisdiction over all of what is now Maine. In 1794, the Passamaquoddy Tribe signed a treaty in which they ceded their territory, except for approximately 23,370 acres. After they had signed treaties in 1796, 1818 and 1820 and a deed in 1833, the Penobscots retained islands in the Penobscot River above Bangor. The Wabanaki People had to survive on a much reduced land base. The Penobscots and Passamaquoddies lived on reservation land that they had not been forced to cede in treaties. In Canada, the Maliseet and Micmac People applied successfully in a few cases to keep some areas. Later, a few other areas were returned to them. The places that Wabanaki People were allowed to occupy were usually remote and isolated. Between 1821 and 1839, the Maine Legislature authorized the harvesting of timber from Passamaquoddy land in violation of the 1794 treaty. Over the years, also in violation of the treaty, the Legislature authorized sale or lease of various pieces of Passamaquoddy land without compensation and without consent of the Tribe. Several of the Penobscots' islands were sold, as well. In the early 1800s, funds from the sale of these islands, only some of which the Penobscots received compensation for, began to flow into the Penobscot trust fund. In 1833, in violation of its own deed procedure as well as a former treaty, the State of Maine transferred to itself four townships which constituted 95% of Penobscot land at that time. The State added to the trust fund the $50,000 paid for the four townships. Moneys from the sale of timber, hay, and shore rights also went into the fund. The Passamaquoddy trust fund was established in 1856 by a deposit of $22,500 for a lease of timber, grass, and power rights. The next year $5,225 was added and in following years additional proceeds from the timber harvest on Passamaquoddy land were added. Interest on the deposits to these funds was supposed to be paid at six percent per year. From 1859 until 1969 no interest was ever paid to the tribes. Instead, it went to the Indian agents. During the nineteenth century, Maliseet and Micmac People, who had always lived on both sides of the United States border, lost their hunting territories in Aroostook County when Americans opened this area to settlement. They were not asked permission, they were paid no compensation, and in the end they were left with nothing. As described in Section 2, the Supreme Court qualified Indian sovereignty in an 1831 decision. Chief Justice John Marshall called Native American tribes "domestic dependent nations." He held that they retain all of their sovereign powers except those specifically taken from them by Congress. His ruling also gave birth of the trust relationship between the federal government and the Indians. The thirteen original states had always claimed exclusive jurisdiction over the Native Peoples who lived within their borders. Thus, the Penobscot and Passamaquoddy People had signed treaties with Massachusetts and Maine, but not with the federal government. They were thought to be "state Indians" living on "state reservations." Similarly, the Micmac and Maliseet People were called "state Indians", even though they had no reservations and no treaties involving land in Maine. Thus, Indians in Maine were considered to have no inherent sovereignty and no right of self-government. They were excluded from the trust relationship and were not eligible for federal programs designed for Indians. In Maine, the State Legislature assumed the authority to make whatever decisions it thought necessary at any given time. State courts also fostered this attitude. In 1842, the highest court of Maine stated that "... imbecility on their [the Indians'] part, and the dictates of humanity on ours, have necessarily prescribed to them their subjection to our paternal control, in disregard of some . abstract principles of the rights of man." The basis for the land claims was simple. In 1790, the First Congress of the United States enacted the Nonintercourse Act, declaring that any transfer of land from Indians to non-Indians had to be approved by Congress. If such a transfer was not approved, it was not valid. This law was designed to protect Indians from unscrupulous and unfair transactions. Between 1794 and 1833, title to most of the land of the Passamaquoddy and Penobscot People was transferred to the State of Maine. The land transfers were never approved by the U.S. Congress until the Maine Indian Claims Settlement of 1980. The Houlton Band of Maliseets eventually became a party to the settlement, as well. Although not a part of the original land claims suit, the Maliseet People also had aboriginal territory in Maine. The basis of their claim was different from that of the Passamaquoddy Tribe and Penobscot Indian Nation, because they had never signed treaties giving up their land in Maine. William Plaisted, a non-Indian, acquired control of a parcel of land in Indian Township from the Town of Princeton, which had seized it as compensation for burying an indigent Passamaquoddy person. In 1964, at a poker game in Princeton, Plaisted won another parcel of Passamaquoddy land next to the property he already controlled. His new parcel included an area that for years had been used as a garden by George Stevens, the brother of Tribal Governor John Stevens. It called attention to the more than 6,000 acres of Indian land that had been sold, leased, or given away in violation of the 1794 treaty. Over the last 150 years, the State had sold, leased for 999 years, or claimed by eminent domain portions of Passamaquoddy and Penobscot land guaranteed by their treaties. It convinced the Passamaquoddy Tribe to file the first land claims lawsuit. They filed a suit in March 1968 in Massachusetts which claimed that Maine had violated the 1794 treaty while it was a province of Massachusetts and which asked for damages of $150 million for 6,000 acres of land that had been stolen from the Tribe. Three days after the suit was filed, their attorney was arrested for possession of marijuana and the lawsuit he filed never went before a Massachusetts court. Attorney Thomas Tureen took over the case on behalf of the Passamaquoddy Tribe. He argued that the 1794 treaty was illegal and that the Passamaquoddy Tribe, Penobscot Indian Nation, and Houlton Band of Maliseets were entitled to restoration of their hunting grounds, an area that encompassed 60% of the State of Maine. In 1972, the Passamaquoddy Tribe filed suit in federal court seeking to force the federal government to get their lands back for them. Passamaquoddy Tribe v. Morton, also sought to establish that the Passamaquoddy Tribe and Penobscot Indian Nation were entitled to the special services that the federal government makes available to Indians in other parts of the country, that they still possess their inherent sovereignty, and that the State of Maine had no power to interfere with their self-government. For nearly 150 years the federal government had provided no services to Maine Indians. The Maine Legislature and Maine courts had long taken the position that the Maine Tribes had lost their powers of self-government and could only exercise the powers the State of Maine specifically gave them. The Passamaquoddy Tribe won this suit in U.S. District Court in February, 1975. In December of that year, the decision was affirmed by the U.S. Court of Appeals. Neither the federal government nor the State of Maine sought an appeal to the U.S. Supreme Court. In a landmark decision in Indian law, the court held that the 1790 Act protected Maine Indians and the federal government had a legal duty to take appropriate action on the land claims of the Penobscot Indian Nation and Passamaquoddy Tribe. Within months, the U.S. Department of Justice announced that it would sue the State of Maine and its largest land holders on behalf of the Tribes for the return of their land if an out of court settlement could not be reached. The federal government also announced that from then on the Passamaquoddy Tribe and the Penobscot Indian Nation would be eligible for the special services, such as education and health care, that the federal government provides to other tribes. In a 1977 memorandum the Department of Justice described the case as "potentially the most complex litigation ever brought in the federal courts with social costs and economic impacts without precedent..." This conclusion was based on the size of the claim (12.5 million acres or 60% of the State of Maine); the number of persons living within the disputed areas (350,000); and the fact that nearly 200 years had intervened between the time the first agreement was reached and the present day. In 1979 the U.S. Circuit Court of Appeals decided in Bottomly v. Passamaquoddy that the Passamaquoddy Tribe (and Penobscot Indian Nation) possessed inherent sovereignty to the same extent as other tribes in the United States and was immune from suit. That same year the Maine Supreme Court, in State v. Dana Socabasin, followed the reasoning of the Passamaquoddy v. Morton decision, reversed its past rulings, and adopted the same view, holding that the inherent sovereignty of the Passamaquoddy (and Penobscot People) survives and the State of Maine has no power to interfere in their self-government. This was a time of excitement and tension for the Wabanaki People of Maine. They were winning in court. Yet the ultimate outcome of their claims was far from certain. The 1790 Act had been written 185 years earlier, and no one could say with certainty whether the authors of that law had intended that land should be returned to a tribe that proved a claim so many years later, if the tribe should be paid only money, or if they should get neither one. The U.S. Supreme Court had not yet decided whether the 1790 Act applied to Maine Indians. Maine's political leaders put pressure on the tribes. The decisions that the Indians had won in court were starting to make it hard to transfer land in Maine because land titles could not be guaranteed. Nor could municipalities issue bonds to finance their own survival. The Governor of Maine persuaded the Congressional Delegation to ask Congress to pass legislation that would bar the Passamaquoddy Tribe and Penobscot Indian Nation from continuing in court by retroactively approving the treaties that their claims were based on. The tribes thought this was unfair and maintained that such a move would be illegal. The situation was very tense until President Jimmy Carter stepped in and called for negotiations in the White House. In March 1977 he had appointed retired Georgia Supreme Court Justice William Gunter to study the merits of the Maine Indian land claims and the defenses to them. The President's appointment of a three-person work group to develop a settlement plan was the result of Justice Gunter's recommendation that the case be settled. Negotiations between this work group and the tribes produced an agreement which was announced in February 1978. An agreement between the Carter administration and officials of the State of Maine was announced in November 1978. During the negotiations, two of the State's strongest concerns were that the federal government pay the entire cost of any settlement and that the State regain jurisdiction over the reservations that it lost when the Passamaquoddy Tribe and the Penobscot Indian Nation were federally recognized. The tribes wanted enough land and money so they could be economically independent and wanted to retain the sovereign rights that just recently had been recognized. It was not until March 1980 that an agreement was reached that was supported by all parties, including representatives of the tribes, large land owners, the State of Maine, and the United States government. Following the March announcement, the agreement was approved by the Passamaquoddy Tribe, the Penobscot Indian Nation, and the Houlton Band of Maliseets. The agreement was then adopted by the Maine Legislature and signed into law by Maine Governor Joseph Brennan on April 2, 1980. The proposal was submitted to the U.S. Senate in June 1980 and to the U.S. House of Representatives in August 1980 and was passed by Congress later that year. President Jimmy Carter signed it on October 10, 1980. The settlement provoked controversy within the Wabanaki communities. Because there never had been a claim like this before, it was difficult to determine what a reasonable settlement would be. If the case were handled like previous claims by the Indian Claims Commission, for example, the outcome would likely have been $1 million and no right to regain land. On the other hand, the Native People were theoretically entitled to their claim to 12.5 million acres of land and $25 billion. A majority of the Passamaquoddy and Penobscot People had favored pursuing negotiation, and the tribal councils appointed negotiators to represent them. A majority also voted to accept the settlement. But some in favor of negotiation opposed the particular settlement offered to them, and others wanted further court action and were against the very idea of negotiation.
. They felt that Native Peoples are sovereign peoples (even when they are not treated as such) and that the settlement fell far short of paying respect to this idea. No amount of land and money could compensate them for the loss of sovereignty. Some believed that a world forum would be more appropriate than the United States court system for deciding an issue involving sovereign people.
. Many were concerned that treating the reservations like municipalities would undermine their capacities to continue as separate and cohesive communities.
. Many people objected to various settlement provisions concerning jurisdiction, including the applicability of state laws on reservations; state hunting and fishing controls; payments in lieu of taxes on reservation properties; state power of eminent domain over trust land, no matter how limited; and the veto power given to the U.S. Secretary of Interior in regard to such things as land use plans.
. Many pointed out that a vote on the complicated legal document was taken so quickly that many people were not entirely sure what was included in the settlement terms.
. Like the opponents, supporters of the settlement also believed that self-determination was imperative. They saw land and money as the practical means of obtaining a new measure of self-determination. They hoped that through wise use of the new wealth they could provide for themselves into the indefinite future, without outside aid and the interference that accompanies it.
. Given their past experience, they had many questions: Could they rely on a non-Native court system to return two-thirds of the State of Maine and award billions of dollars in damages, when the law demanded it? Could they rely on a non-Native Congress in Washington to be fair, when some claimed it had the power to extinguish much of their claims simply by passing a law that ratified the old treaties? How many people in Maine would turn angrily against them due to the economic disruption caused by such a protracted legal struggle?
. They were concerned that outcome could not be foreseen. There was no guarantee that they would emerge from such a struggle with something they wanted or even with those rights already recognized. The arguments of settlement supporters carried the day and resulted in the agreement of the Passamaquoddy Tribe, the Penobscot Indian Nation, and the Houlton Band of Maliseets to the Land Claims Settlement of 1980. There was a serious chance that the State of Maine and some of its citizens might have some substantial liability. The settlement would extinguish all Indian claims to Maine land and Maine money. If the matter went to trial, it would be very costly to the State. During an uncertain period of litigation the ability of the State, municipalities, and private corporations to market bonds would be severely jeopardized. Titles to real estate would be difficult to transfer. There would be serious economic and social disruption and turmoil. The settlement was financially advantageous to the State. The federal government would appropriate millions of dollars to enable the tribes to purchase 300,000 acres of land. Because the tribes would receive substantial federal financial assistance as federally recognized tribes, the State could terminate its funding ($1,718,000) for the Department of Indian Affairs, Indian Education, and the Maine Indian Housing Authorities. "... [T]he framework of laws in this Act is by far the most favorable state-Indian jurisdictional relationship that exists anywhere in the United States. As a general rule, States have little authority to enforce state laws on Indian Lands. Tax laws, water and air pollution laws, zoning laws, health laws, contract and business laws and criminal laws--all those state laws are usually unenforceable on state Indian Lands. More than half the states in the United States have Indian Lands within their borders and most of those states are engaged in continual battles with Indian Tribes over the question of whether state laws apply to those lands. In fact, in Maine, the State Supreme Court has recently ruled that Maine cannot enforce its criminal laws on the existing Indian Reservations and ... lacks jurisdiction over those Reservations ... If the Indians were successful in the Land Claim and recovered some land, not only would we lose the land, but also we would probably be unable to enforce State Laws on those lands. I believe such a result would be intolerable. The proposal before you not only avoids such a situation, but recovers for the State much of the jurisdiction over the existing reservations that it has lost in ... recent litigation." Landowners potentially affected by future land sales also supported the Settlement. A representative of several large landowners (Great Northern Paper Company, Diamond International Corporation, Georgia Pacific Corporation, International Paper Company, St. Regis Paper Company, Scott Paper Company, Pingree Heirs, the Dead River Group, and Bertrand Takach) testified in support of the settlement during the March 1980 hearing before the Joint Select Committee. Four years of negotiations led to a settlement out of court and the Maine Indian Claims Settlement Act of 1980. The Passamaquoddy Tribe, Penobscot Indian Nation, and the Houlton Band of Maliseets received $81.5 million, the largest settlement of its kind and the first to include provisions for the reacquisition of land. To get this award, the tribes had to give up their claim to 12.5 million acres and give back some of the powers of self-government that recently had been recognized in the courts. The settlement included neither Maliseet People outside of the Houlton Band nor any Micmac People. They also claimed title to parts of what is now Maine, but by the terms of the settlement, under which they received no land or money, their claims were extinguished. An agreement between the State and the Indian Tribes, called the Maine Implementing Act, that was enacted by the Maine Legislature. This specifies the laws that are applicable to Indians and Indian lands in Maine. Purchase options running from certain landowners to the Maine Indians in which the landowners agreed to sell at fair market value 300,000 acres of land to the Tribes. A bill that was enacted by Congress, called The Maine Indian Claims Settlement Act, extinguishing the land claims, compensating the Indians for their claim, and ratifying the Maine Implementing Act. With the settlement, the Houlton Band of Maliseets obtained federal recognition and the Penobscot Indian Nation and Passamaquoddy Tribe continued to be federally recognized, while forging a new relationship with the State. The basic principle of the settlement is that all Indians and Indian lands in Maine are subject to state laws to the same extent as other persons and lands in Maine, except that the Passamaquoddy Tribe and the Penobscot Indian Nation are accorded certain rights of self-rule. The Maliseet People in Maine who are not part of the Houlton Band and the Micmacs, who had been recognized by the State of Maine since 1973, were not federally recognized in the settlement. As a result of the settlement, the Maine Department of Indian Affairs, which acted as an advocate and liaison with other state agencies, was abolished. Thus, those ignored by the settlement also lost services that had been provided by the State. It was not until late 1991 that the Aroostook Band of Micmacs finally won federal recognition. The Settlement Act states that only the Penobscot Indian Nation, the Passamaquoddy Tribe, and the Houlton Band of Maliseets have any claims to land in the State of Maine, and that other Maine Indians abandoned their holdings. It ratifies all land transactions in which any Maine Indians lost their lands by treating such transfers of land as though they were done in accordance with the laws of the United States. This has the effect of extinguishing all Indian land claims in Maine, except for the three reservations. It releases the State from any obligation it ever had to any Indian person, tribe, nation, or band, including groups that are not part of the Settlement. Of the $81.5 million provided under the settlement, $54.5 million was established as a Land Acquisition Fund: $26.8 million each for the Penobscot Indian Nation and the Passamaquoddy Tribe and $900,000 for the Houlton Band of Maliseets. The first 150,000 acres of land acquired by the Passamaquoddy Tribe and the first 150,000 acres acquired by the Penobscot Indian Nation is eligible for inclusion as part of their respective territories and is held in trust by the United States for the benefit of the tribes. Land purchased outside these designated areas is owned by the tribes in the same manner as non-Indians. Land purchased by the Houlton Band of Maliseets must be approved by the Maine Legislature. The settlement specified the circumstances under which trust land can be taken by the State or the federal government for public uses, and states that land taken in this way must be replaced with other land within two years. The terms for land management and administration established by the Passamaquoddy Tribe and Penobscot Indian Nation must be agreed to by the U.S. Secretary of the Interior. Out of the $81.5 million settlement, a Settlement Fund of $27 million was established: $13.5 million each for the Penobscot Indian Nation and the Passamaquoddy Tribe to be held in trust by the U.S. government. The money is invested by the Secretary of the Interior as agreed to by both parties. The income from the investments is distributed quarterly to both parties. This income is tax-free and without restriction, except that interest from $1 million each is designated to be spent for the benefit of elders over 60 years of age. Although the Houlton Band of Maliseets received federal recognition under the settlement and $900,000 for land purchase, it gained no trust fund. Be subject to the laws of the State. However, internal tribal matters (including membership in the Passamaquoddy Tribe or Penobscot Indian Nation, the right to reside within the respective Indian territories, tribal organization, tribal government, tribal elections, and the use or disposition of settlement fund income) are not subject to regulation by the State. Under the settlement, the Houlton Band of Maliseets does not have a status similar to that of municipalities and is entirely subject to state law. As federally recognized Indian tribes, the Passamaquoddy Tribe, the Penobscot Indian Nation, the Houlton Band of Maliseets, and (most recently) the Aroostook Band of Micmacs are eligible for all federal Indian benefits. All federal laws concerning Indians apply in Maine unless they are contrary to settlement terms. They may adopt constitutions consistent with the Settlement Act. The Indian Child Welfare Act, a federal law designed to protect Indian families and communities from losing their children, applies to them, thereby recognizing the exclusive jurisdiction of the Tribe and Nation over Indian children living on their reservations. They may sue and be sued, but have sovereign immunity to the same extent as a municipality when acting in their governmental capacity. They may have their own courts with exclusive jurisdiction over minor crimes, minor juvenile offenses, minor civil disputes, divorce, and child custody matters for their members. The Tribe and Nation use the State of Maine's definition of crimes. They may make the rules for hunting and trapping in their Indian territories and for fishing on any point that is entirely within the territory and is less than 10 acres in area. The rules cannot discriminate against non-Indians allowed to hunt and fish in the territories, except that there may be special rules allowing individual members of the Tribe or Nation to hunt, trap, or fish for their own food. The State Commissioner of Inland Fisheries and Wildlife can overrule the Passamaquoddy and Penobscot fish and wildlife regulations, if it can be proved that they cause a significant depletion of fish and wildlife outside the Indian territories. They must make payments to the State equal to the amount that would otherwise be imposed by county, district, state, or other taxing authority that are called "payments in lieu of taxes", so Indian lands cannot be taken by the State under its tax laws. The terms of the settlement allowed the State to repeal the Maine Department of Indian Affairs and most of the state laws specifically relating to the Passamaquoddy Tribe and Penobscot Indian Nation. One of the laws repealed stemmed from federal law allowing Indian reservations to set air quality standards on the reservations that surrounding non-Indian communities may not violate. It is required to review and make reports concerning the effectiveness of the settlement act and the social, economic, and legal relationship between the State and the Passamaquoddy Tribe and Penobscot Indian Nation. 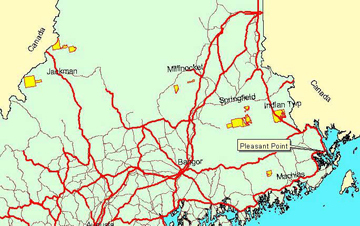 No lands other than those described in the settlement may be included in Passamaquoddy or Penobscot Indian Territory except on the recommendation of the Commission; approval by the local legislative body if located in a city, town, village, or plantation; and enactment by the State of Maine. The Commission has authority to promulgate fishing rules on certain ponds, rivers, and streams adjacent to or within Passamaquoddy or Penobscot Indian Territory. The Commission is required to study and make recommendations about fish and wildlife management policies on non-Indian lands in order to protect fish and wildlife stocks and lands and water subject to regulation by the Passamaquoddy Tribe, Penobscot Indian Nation, or the Commission. The deadline for tribal governments to acquire trust lands identified in the Settlement Act has been extended several times. Additional parcels of land which can be held in trust for the Tribe and the Nation have been added to the list of lands in the Settlement Act. There have been several clarifications and expansions of tribal court jurisdiction. The computation of state funding for Indian schools has been clarified. There have been amendments concerning the acquisition of trust land by the Houlton Band of Maliseets and the use of this land for governmental purposes. 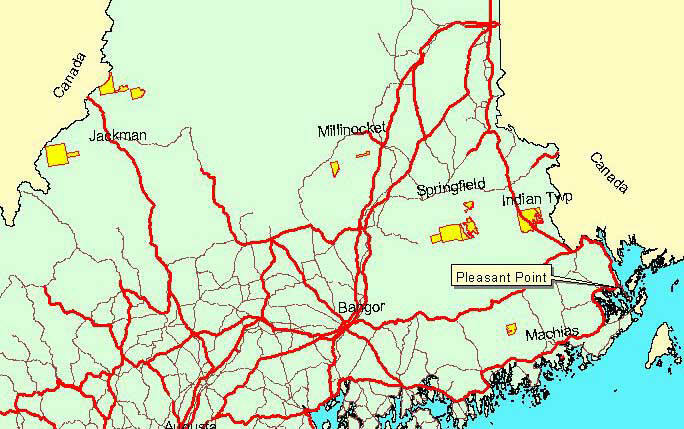 Who has the authority to regulate land use in the Penobscot and Passamaquoddy trust lands ... the State or the Tribes? The tribes proposed legislation to the 115th Maine Legislature to give them this authority. The Legislature enacted a compromise, which the Tribe and the Nation subsequently endorsed. However, the Governor vetoed the bill and the Legislature did not override the veto. To what extent do the tribes or the State have jurisdiction over tribal trust lands? This is the broader question behind the debate about land use. It also has arisen in relation to proposals by the tribes to expand tribal court jurisdiction. To what extent do environmental decisions by the State affect the sustenance rights of tribal members? There have been concerns that permitting actions by the Board of Environmental Protection may have the effect of diminishing the quantity and quality of fish and wildlife available for tribal members. LD 99, An Act to Ensure the Protection of Tribal Fish Stocks and Other Natural Resources, raises this issue to the 119th Maine Legislature. To what extent is the State is in compliance with requirements to make public benefits available to the tribes? The Implementing Act provides that the Passamaquoddy Tribe and the Penobscot Indian Nation and residents of either Indian Territory are entitled to receive benefits from the State under state and federal programs, provided that federal funds received "within substantially the same period" for a "substantially similar" purpose are deducted. The tribes do not believe that they have received all of the public benefits for which they are eligible or to which they are entitled. To what extent should the Maine Implementing Act be amended? Some state officials have voiced the concern that the tribes are trying to renegotiate the settlement, whenever they request an amendment to the Act. The tribes point out that the settlement was drafted in terms of concepts rather than specific statutory references and do not believe that the Implementing Act is the final word on tribal-state relations. These issues and other settlement-related issues are complex and require ongoing discussion by the State, the Passamaquoddy Tribe and the Penobscot Indian Nation.